Can Floor Graphics Increase Your Direct Traffic? Investing in floor graphics can do wonders for your business. The rise of the internet, social media and online marketing has changed the face of business. It feels like most of our time and energy is spent on figuring out how to drive people to our websites, increase online sales, or get people to actually read our Facebook posts. But what about marketing strategies to get people to actually walk into our physical stores? One you may have never considered is the use of floor graphics. These are large scale ads, usually a large vinyl decal, that can be adhered to the floor to catch the eye of customers as they are walking by. They lay flat on the ground so that they aren’t a safety hazard. They can be used within the interior of a store to lead customers and increase sales opportunities or in the common mall areas to direct traffic to the store. There are even some that can be placed outside, as they’re designed to withstand the elements and adhere to the rougher surface of the street or sidewalk. Picture an image of a stage floor overlooking a packed audience where people can stand and pretend to be a rockstar before coming into your music shop for lessons. Floor graphics offer an unlimited canvas for fun and creativity. Since your only real limitations are going to be budget and the size of the floor you’re working with, you can finally have room to go a little wild with your creative advertising. These eye-catching marketing tools can also act as a conversation starter to give your employees a more subtle opening to interact with guests. 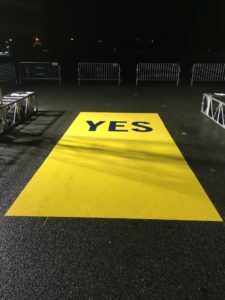 Finally, floor graphics also tend to be eye-catching because many of us are already looking down as we walk and because they break up the usual visual monotony of the ground. Like any other branding or advertising, your floor graphics have to be well designed. This means that they have to be colorful and eye-catching, clear and vivid, in line with your brand, and have a strong message. A solid floor advertisement has a good “call-to-action” message like “visit us on the third floor” or “ask for a free sample”. You can use them to promote a sale item, encourage guests to seek out staff, or simply make them laugh and feel a connection to your brand. And the bottom line is that they actually work. Studies in Germany have shown that 50% of customers notice floor ads and when comparing stores that have them to stores that don’t (within the same business), the stores that use floor ads sold about 17% more. This entry was posted on Thursday, January 17th, 2019 at 5:28 pm. Both comments and pings are currently closed.